Traditionally, innovations in the FinTech space have been held back by regulatory uncertainties and a conservative approach on the part of the government on such matters. Separately, incumbent financial institutions have also demonstrated a preference for slow and steady improvements as opposed to disruptive innovations. However, over the past year, we have seen a paradigm shift in these perspectives. The fast-paced digitization has unlocked fresher avenues for fintech players, especially the ones asso-ciated with SME-based lending. With the increased digital adoption by business owing to demonetiza-tion and the rollout of GST, both of which have exponentially increased the business centric data, 2018 will be the year of action for SME lending-based fin-tech players. Policy support towards small business lending will ensure greater capital flows to alternate lending platforms. This will be match. Technologies such as artificial intelligence, machine learning, blockchain and IoT have a wide range of potential use cases in the FinTech industry. While these technologies have been around for some time and have even seen adoption in western economies over the past decade, they have remained in a nascent state in the Indi-an landscape. However, now as we reach parity between India and developed economies, we are witnessing more of startups using these more advanced technologies. 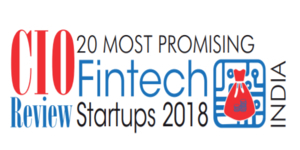 Therefore, we bring to you a list of 20 Most Promising Fintech Startups 2018. Being closely scrutinized by a distinct panel of judges including CEOs, CIOs, CXO, analysts and CIOReview editorial board we believe that these startups will help you bring about the perfect balance between technology and the varied demands of the Finance domain. We present to you CIOReviewindia 20 Most Promising Fintech Startups - 2018. AnyTimeLoan.in Expertise revolves around credit approval engine, P2P lending platform, artificial intelligence (AI), machine learning and predictive science. Avanse Provides customized loan structuring solutions and flexible repayment plans for students. Bizloan Offers financial assistance using analytical tools and data science to micro, small and medium enterprises. CreditMonk A FinTech startup in the financial information services space providing availability of authentic credit information to manufacturers, distributors and professionals. EzeePay A utility bill paymentscompany catering services such as recharge, utility bill payments, and ticket booking. FidyPay Focuses on financial inclusion, marco digital payments, integration and paperless banking. Financepeer Builds Artificial intelligence based platform that connects borrowers to lenders with completely digital KYC. Finly The solution portfolio enables expense report automation, prepaid card for businesses, petty cash management, vendor payments and automated collection. i-Lend An online personal loan marketplace connecting individual creditworthy borrowers and potential individual lenders. KapitalTech Offers statistical modeling-based proprietary analytics engine and collateral-free short-term loans with customized loan repayments. Lima Payments Specializes in digitization of business processes, payments,UPI, sales management, order management, logisitcs, financing, and procurement. Loankuber Facilitates customers with finances, mortgage solutions and personalized advice. neoEYED Developes secuirty solutions based on behavioural analytics. Novopay Solutions Specialties lie in banking, payments, retail, Fintech, banking software, digital banking, financial technology, and core banking. OpenTap A FinTech company providing alternate finance / lending services for the middle to low income group. PaySense Delivers solutions for mobile payments, risk management, data analytics along with credit and financial services. Phonepe Avails mobile payments wallet for money transfer, mobile recharge, DTH, electricity bill, water bill and metro card. Rubique Assists businesses with access to finance through a wide range of credit cards and loan products. Tavaga Delivers a robo-investing platform for investment management that includes customized advice for goal-based investing. Upwardly Competency lies in financial advisory, wealth management, investments, robo advisory, personal finance, and financial planning.